Canadian Daily Deals: Swagbucks Get $5 Bonus When You Sign Up in December! 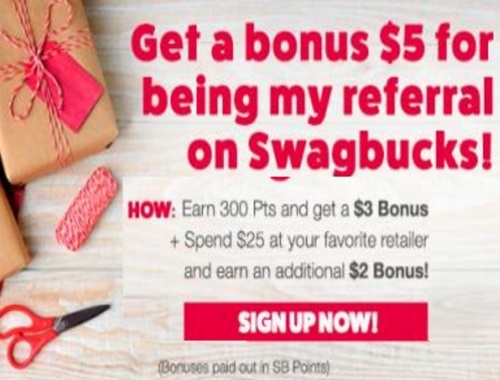 Swagbucks Get $5 Bonus When You Sign Up in December! 2. Earn 300 SB total before January 11, 2017. You'll get a $3 (300 SB) bonus for it! That's it. It's super easy, and Swagbucks is for real. I use it myself, and I' earn $100 Paypal every month just for using the site!